Mokugyo Size. 4,5 Size 4,5 : 13,5cm Mokugyo an instrument of Soto Zen Buddhist or Rinzai (music that accompanies the liturgical texts Buddhist sutras). Some use it to make predictions.It is a round wooden block (with more or less ornaments) that one strikes with a stick at a regular rhythm . It sometimes has the shape of a fish. Mokugyo Size. 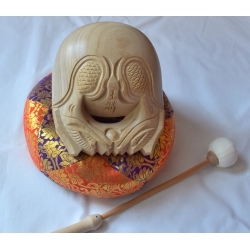 5 Size 5 : 16cm Mokugyo an instrument of Soto Zen Buddhist or Rinzai (music that accompanies the liturgical texts Buddhist sutras). Some use it to make predictions.It is a round wooden block (with more or less ornaments) that one strikes with a stick at a regular rhythm . It sometimes has the shape of a fish. Mokugyo Size. 8 Size 8: approx. 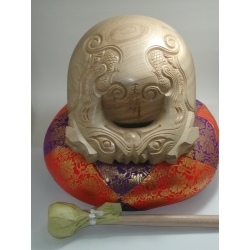 25cm Mokugyo an instrument of Soto Zen Buddhist or Rinzai (music that accompanies the liturgical texts Buddhist sutras). Some use it to make predictions.It is a round wooden block (with more or less ornaments) that one strikes with a stick at a regular rhythm . It sometimes has the shape of a fish.